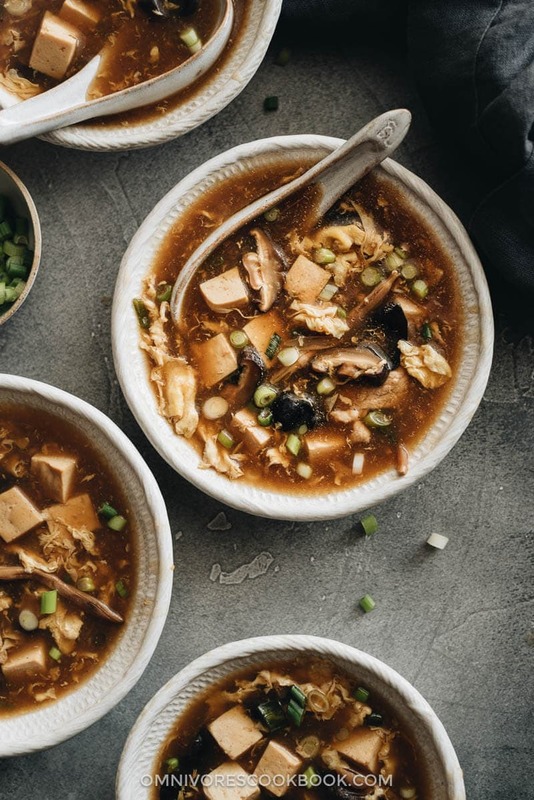 Hot and sour soup is such a popular dish takeout dish, along with egg drop soup and wonton soup. It’s one of those things that we almost always order when eating in a restaurant. The soup is loaded with so many goodies that I totally wouldn’t mind serving it as a main dish for a light dinner. 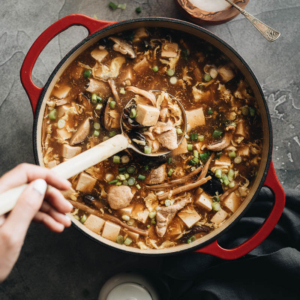 Did you know that hot and sour soup is actually super easy to make? The sourness of the soup comes from the Chinkiang vinegar. And the spiciness comes from the white pepper powder. No peppers or chili oil required! 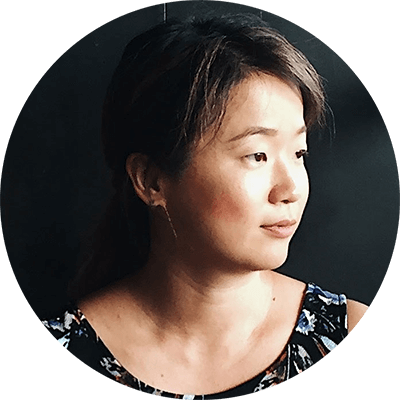 My recipe uses some dried ingredients that might require a trip to an Asian market or a purchase on Amazon. But if you don’t want to make the extra effort, you can totally skip these ingredients. I will explain why. 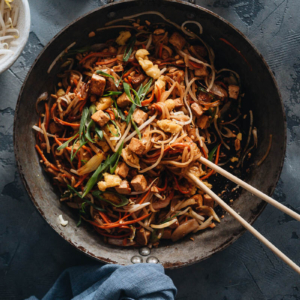 I previously discussed how to use Chinese dried veggies to create a superior flavor in another recipe – Buddha’s Delight, a Jai (Buddhist vegetarian) dish. The logic is the same here. 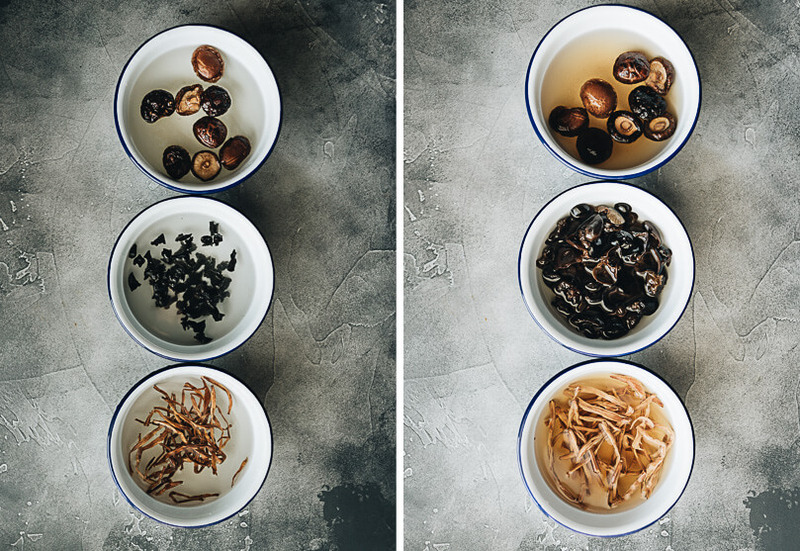 The foundation of the broth consists of dried lily flowers and dried shiitake mushrooms. They both have a very concentrated smoky, earthy, and woody aroma. Once you rehydrate them, the rehydrating water will turn a dark brown color as it becomes infused with the great flavor. Do not throw this water away. It is the best vegan broth and you should use it to make the soup base. The other dry ingredient is wood ear mushrooms. It is a mildly flavored fungus that adds a crunchy texture to the dish. 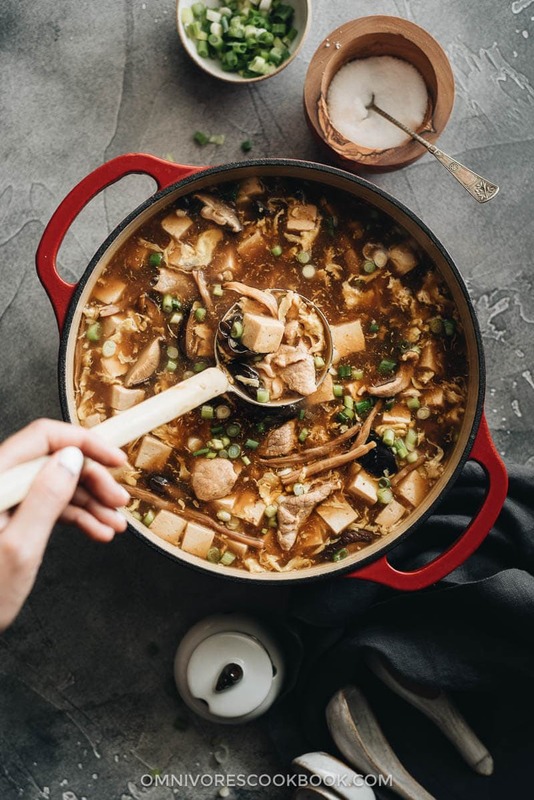 Chinese families always have these ingredients on hand because they allow a cheaper and healthier way to create a flavorful broth. If you use these ingredients, your soup will turn out more like the Chinese restaurant version. However, if you do not have these ingredients, simply skip them and use chicken stock or vegetable stock instead of water to make your soup. Simply skip the “marinate” part of the recipe, including the pork and the few ingredients for the marinade. 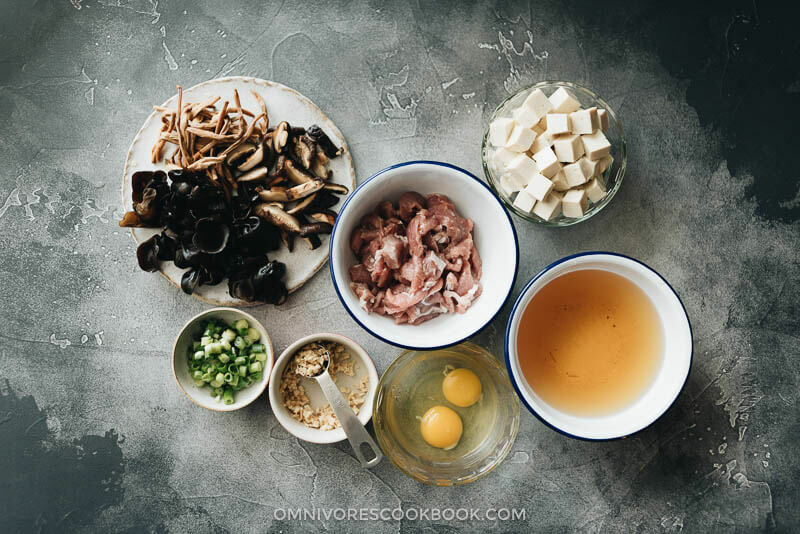 Many Chinese recipes use a small amount of meat to add volume and texture to the dish. Skipping the meat won’t affect the flavor of the soup. There are so many more ingredients that work well in this dish. For example, some of my favorite vegetables include – tomatoes, napa cabbage, bamboo shoots, mushrooms, and bok choy. You can also use a different type of protein to replace the pork. For example, chicken or shrimp would work great. You can even throw in a few slices of cooked sausage or ham to make the cooking faster. Add vinegar and white pepper at the end of cooking – this is very important. Otherwise the pureness of the vinegar will disappear as the vinegar evaporates and the white pepper will release a bitter taste if heated for too long. Gently rinse dried shiitake mushrooms, dried wood ear mushrooms, and lily flowers with tap water. Soak each of them with 1.5 to 2 cups warm water in three big bowls. Rehydrate for 30 minutes to 1 hour, until tender. Slice mushrooms into strips. Snip off the tough ends of lily flowers and discard. Remove tough ends of wood ear mushrooms, then chop into bite-sized pieces. Combine pork, Shaoxing wine, salt and cornstarch in a bowl. Mix well by hand. Marinate for 10 - 15 minutes. Add Chinkiang vinegar and white pepper into a small bowl. Mix well until the white pepper is completely dissolved. Add water or chicken stock, ginger, and green onion into a pot and heat over medium-high heat. Add rehydrated wood ear mushrooms, shiitake mushrooms, lily flowers, and tofu to the pot. Cook until bringing to a simmer. Add soy sauce and turn to medium-low heat. Mix the cornstarch with 1/4 cup of water in a bowl until cornstarch is fully dissolved. Slowly swirl the cornstarch slurry into the soup. Stir to thicken the soup. Add the pork from step one into the soup, stirring several times to prevent the pork strips from sticking together. Add the salt. Slowly swirl in the beaten egg and stir well. The egg should be scattered and not clotted. Remove the pot from stove. Add the vinegar and pepper mixture and stir to mix well. Garnish with cilantro and drizzle with sesame oil. Give it a final stir. If you do not have these dry ingredients, you can use half a pound of fresh mushrooms instead. Then use chicken stock instead of water to make the soup. Skip the meat if you want to create a vegetarian dish. 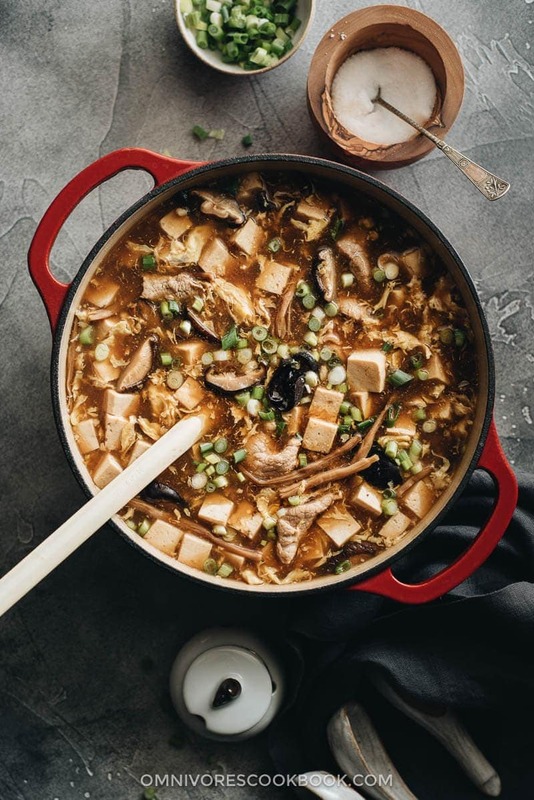 Use chicken stock or vegetable stock instead of water if you are not using the dry ingredients (shiitake mushrooms, lily flowers, and wood ear mushrooms) in this recipe. The recipe was originally published on April 9, 2014 and updated on June 5, 2018. I love this soup and I know a few people who’d be smitten if I made it for them! I just cooked a pot of this, and it is delicious! I am impressed that such a rich soup can be made so easily without any pre-made broth. Thanks for sharing the secret. This soup would be amazing right now because it’s so cold in DC! I love that you included a video – it’s so good! My hubby loves this soup. He will flip when I make it for him. Pinned. You should try some white hot and sour soup with hot oil. Do you not know that the adding of soy sauce is relatively new to this very old soup. By far the white soup is hands down the best I have ever had! Do you have a recipe for the White Hot and Sour soup to share or is it just omitting the soy sauce that makes it white/light? This was spot on. It was interesting to see how you can make a satisfying stock without much meat or stock cubes. Hi Colin, I’m glad to see you like this recipe! Back in Beijing, my mom served soup almost everyday and most of the time she didn’t use a stock. 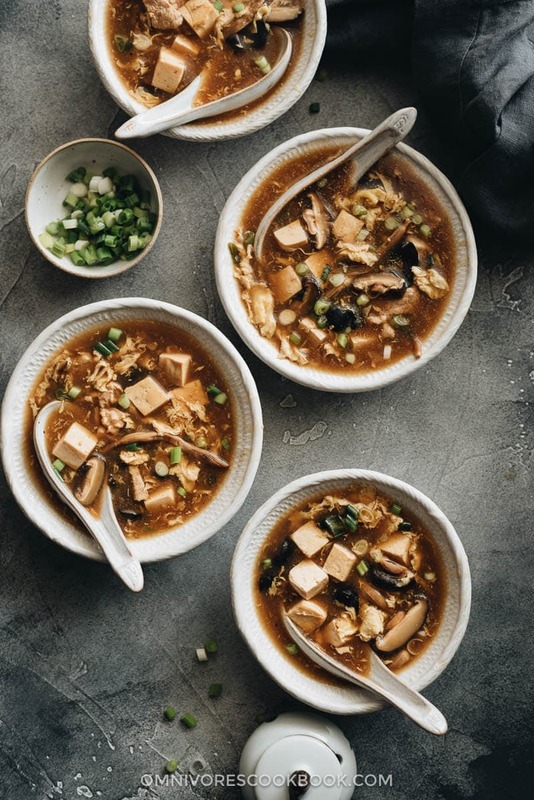 The hot and sour soup is definitely one of our favorites. The other soup without using stock: soak some dried shrimps and dried scallops for 30 minutes, and use them to make a seafood clean broth. We usually add some napa cabbage (or other greens) with tofu. The soup was quite light, but flavorful. Thanks Maggie; next time I go to the Chinese supermarket, I’ll look out for the dried shrimps and scallops, and I’ll look forwards to trying them. I’ll also need another bag of shiitake; I have chicken stock in the freezer, but it is quite precious stuff and I can’t use it every time. I’m glad to help! The homemade chicken stock is precious in our house too. I’ve been trying a new thing lately, by using a bit pancetta (might able to be replaced with bacon) to make a pork soup. I will share the recipe soon. By the way, have you ever tried miso soup? It’s not Chinese food, but we love it. So simple to make and does not require using a stock. “Miso”, that can go on the list too! Definitely! It’s so easy to use, stay in fridge forever, and go well with any veggies and protein! Hi, I love Hot and Sour Soup and I will try this. 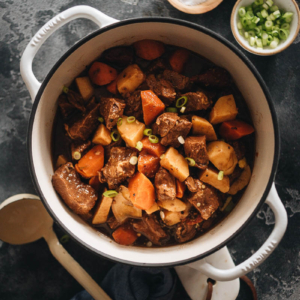 You’re clear information on how to make a flavorful broth with those dry ingredients is so true. Those ingredients make a wonderful broth. I am in Japan and I can add a note to the MISO SOUP question, here in Japan they would use a quickly made broth made from kelp and or bonito flakes. Making Miso Soup with just hot water is unheard of. Also, instant/powdered kelp/bonito is available too, making soup making easier. Hi Maggie. From the website Pantry section I learned about different types of rice vinegar. For the hot and sour soup, which type of rice vinegar you prefer? I noticed that you used a black vinegar but was it the Chinkiang or the Shanxi Extra Aged vinegar? Thanks Maggie. Your website is such a great resource for my Chinese cooking . Thank you! My husband and I loved the soup. I saw 1 teaspoon white pepper in the ingredients and I thought that was an awful lot. I put in 1/2 teaspoon and it was right at the edge of being too hot for us. Had I put in the whole teaspoon we would have had to call the fire department LOL. Hi Eva, I’m glad to hear your soup turned out not too spicy. My family loves very spicy food and we might have added too much white spice powder! This may seem obvious, but I am a novice cook. I am supplying for soup for my son’s teachers and your recipe was the one that I signed up to bring. Is it okay to leave this soup in the crockpot on warm so the teachers will have it warm for their lunch? Hi Melora, yes you can keep the soup in crockpot. The cornstarch slurry will start losing thickening power if you keep the soup heated for too long time. But I think it should be OK as long as you make the soup the same day you serve it. Happy cooking and I hope the teachers will enjoy the dish! Hi very nice recipe but I have a question if I didn’t want to use wine can I substitute it with vinegar? Hi Stella, you can replace the wine with water, broth, or oil. Or skip the salt and use 1 teaspoon soy sauce instead. Shaoxing wine is usually in China to eliminate the gamey flavor from the pork. But I found the meat in the US is less gamey, so it’s OK to skip the wine. Thank you! I made this soup today and it was excellent. I’ll definitely make it again! IS it possible to make this vegetarian? She mentions in her recipe that to make it vegetarian, just omit the meat. And she says elsewhere that the meat is just to add texture (and nutrition, which is debatable), but there are plenty of other elements that add texture, so I think you should definitely go for it! Hi! This recipe looks great and am looking forward to trying it. I just need to know what rice vinegar did you use. The one I found at my local store was white but I noticed you use black. Would it still work the same? Hi Jess, I used Chinkiang vinegar, which is also called Chinese black vinegar. I highly recommend using this type because the flavor is very different from the light rice vinegar. You can find the vinegar on Amazon or on The Mala Market. Glad I read the other questions before I asked the same question. Love my Black Vinegar, just a little bit adds what had been missing from my Chinese dishes. I have a great Asian Market down the street and have always found any ingredient your recipes called for. Really looking forward to trying this. Is white pepper powder different from what we just call white pepper? Hi Clinton, I’m pretty sure it’s the same thing. I mention powder because sometimes people do buy the whole white peppers. The soup tasted fantastic! Thanks. It’s particularly impressive because the recipe is so simple. I’ve shared it with a couple of my vegetarian friends too. Don’t substitute for the Chinkiang vinegar or white pepper. And, rather than cornstarch, I add a handful of broken, dried noodles. You get the starch thickener, and a bit of complexity. hi maggie great recipe. 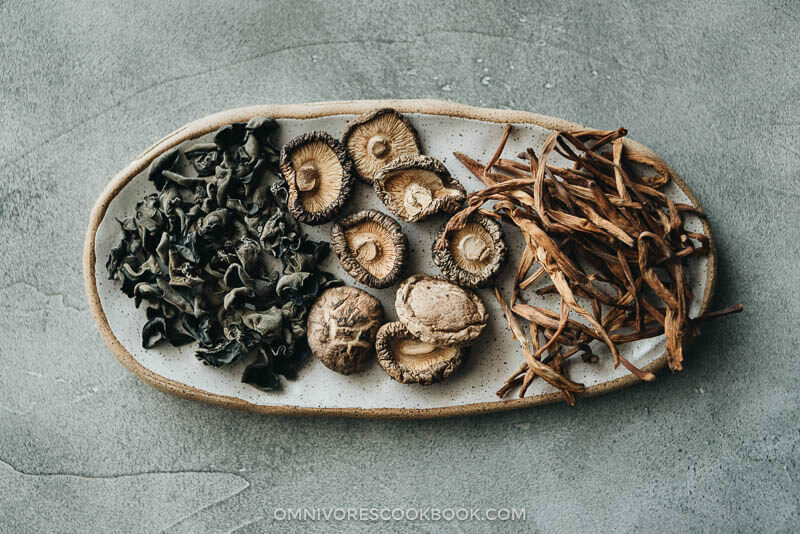 one question – if using the soaking water for the dried shiitakes and lilies, how much water do you add. still 6 cups? Yes, still 6 cups. You probably don’t have enough soaking water, so just add all the soaking water you can then use regular water for the rest. Happy cooking and hope your soup turns out great! I have made this twice. It is fabulous. I do TRY to follow the directions explicitbly. I went to out local Asian market and a nice lady helped me get the mushrooms. The first time I didn’t chop mushroom.. just through them in pot. What started to be the size of a baby rose hydrated to a Hydrangea.size…. I’ll never do that again. Anyway the recipe is great. House smells good. It’s definitely here to stay. thanks for the recipe! made it tonite!! super delish!!! tastes like restaurant. one question tho.. when do you add the ginger and green onion.. it doesnt say in the recipe.. or am i not seeing it??? thank you again !! love your recipes~~!!!! Oops, sorry I forgot including those ingredients in the direction. Thanks for letting me know and I just edited the recipe. Hey Maggie, I’ve made this soup three times earlier this year. It was fantastic. As kids my sister and I loved the hot and sour soup from our favorite restaurant. We’ve since developed a gluten sensitivity and can no longer eat at that place. Your soup tasted 100% like our well-love childhood favorite and it brought us heaps of joy! thank you so much!! I was wondering, when you updated the recipe did you change any of the ingredients or methods or just the beautiful fotos? Thanks so much! Well, I’ve been making your Authentic Hot and Sour soup for quite awhile. I love it and eat it often using the recipe I originally got from your website and loaded into my recipe app. I told my sister about it, so she went here to your website and started asking me questions that made no sense to me. Now I see that you have changed the recipe from the one you used to have. We’re both curious to know why and to know if you’ve completely removed the first recipe from your website. Nice site, good visuals and explanations! I’ve been making hot and sour soup for 42 years ever since I first had a really good bowl of it as a teenager! It’s never made the same way twice! It usually depends on what I have on hand though I always have lily buds, shiitake, and black fungus on hand. Come to think of it, I have lots of dry fungi lurking in my pantry! ;D With this last batch, I’d made a stock from bones leftover from beef roast. The broth screamed hot and sour soup! I had some leftover corn that became part of the ingredients list. I used leftover egg shreds (kinshi tamago) instead of stirring raw egg in. I also added a big glop of fermented black bean in sesame chili oil. My soup was thick enough corn starch was not needed. Being half-Japanese with a Chinese aunt and cousins through marriage, food was a lot of fun! Thanks so much for sharing! Hi! I just made your recipe last night, and my husband of seven years ate five large servings. I think that’s the most of anything I’ve made for him ever. I was hoping you could recommend a brand of ng vinegar cause the one I got at 99 ranch market yesterday sucked. I just read your bio, and I’m in Austin, TX too. Thanks for the excellent recipe. Hi Maggie, We (Shanghaiese wife and I) made this yesterday but omitted the pork and added six chopped jumbo (16-20) shrimp and about 4-5 oz of tilapia. It was not quite spicy enough for my taste so added a little hot chili in oil and came out excellent. Thanks for sharing that one. I have copied a few more of your recipes and will make them in due course. I’ll let you know how this old American can cook your Chinese dishes. Can you use the soaking liquid for the mushrooms and wood ear, etc. ? I don’t see that as recommended in your recipe. Hi Anil, yes, you can use the soaking liquid from the mushrooms. I usually don’t use the wood ear soaking water because it contains next to none taste. Love this recipe!!! Thank you so much for sharing. My parents have a neighbor from Taiwan who makes hot and sour soup that’s amazing and this is as close as it gets. Your recipes are so authentic and easy to follow. Now my family think the mapo tofu and hot and sour soup surpassed even the most expensive restaurants. Maggie, I love Hot and Sour Soup and authentic Asian food so much that I am started to doubt my alleged 100% Italian heritage. With the hot and sour soup I NEEDED to find a recipe instead of ordering it takeout once or twice a week. I’m still trying to perfect your recipe and tonight is my third try. My first try, I didn’t realize that the dehydrated mushrooms and tofu “blew up” so much, but the taste was really great (I am fortunate to have a large Asian supermarket near my workplace). The second time, I rushed the process and it was not so good but that was my bad for rushing.. Tonight, I took my time, sliced the dried mushrooms and pulled the hard stem of the dried lily flowers before I rehydrated them and also made sure to slice the tofu into tiny slices. So far, it is going good, but I’m wondering what I can use to add a very slight sweetness to it. Thank you. Just made my 3rd pot of this and love it! Thanks so much, this recipe is a keeper. By now I have my alterations nailed. I love this recipe! The only thing that would make easier to make is to have dehydrated ingredients amounts in grams. I found it difficult to measure those ingredients . Your recipe doesn’t state how much soup stock to start with. I ended up using 2 quarts, adjusted amounts, we’ll see. I had some leftovers that I thought would be complimented by a hot and sour soup base, so I jumped on the internet and this recipe came up. I loved the fact that up front you stated the three basics elements for the soup base . (FWIW, I would add ginger and egg to your three.) .I threw everything together …. and the whole family said, “You have got to make this again!”. I don’t know what I did (that is the legacy of leftovers), but I know that I’ll be making this soup again. All thumbs up from us!! So the water that you use to soak the mushrooms in is used as the broth? Are the pork strips cooked in advance, or added raw? Hi Stan, these pork trips are added raw. They cook so fast (if you cut them very thin) and you want to just cook them through so they stay tender. Hi Alice, this soup tastes the best when you serve it fresh. The cornstarch will lose its potent if you freeze or fridge it. So if you did so, you need to reheat the soup in a pot and add more cornstarch slurry at the end so it reaches the same consistency. Got it! Thank you, Maggie!! I made this recipe a few nights ago and it was delicious!!! This recipe is sooooo good!!!! 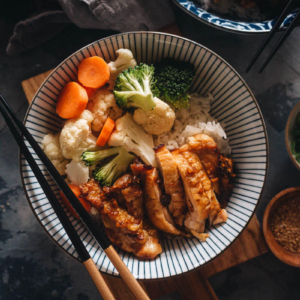 I usually don’t have high hopes when I try Asian recipes simply because I don’t live near an Asian market, and thus I have to substitute or go without a number of key ingredients. That being the case, this recipe was top notch! I didn’t have the dried mushrooms or lily flowers or the wine, but it is still excellent. I am already planning the next night that I will make this. Hi Sandra, you could simply skip the tofu and the soup will be just as tasty! Always wonder how to cook this soup. All westerners love it but being Chinese I prefer something lighter. Anyway I cook for dinner parties with resounding success. Thanks Maggie very much. Made a vegetarian version. I had no lilies but I used turkey tail broth, shiitake powder, fresh wood ear., and subbed wild garlic scape for the green onions. Delicious, complex, and satisfying thanks for a better-but-easy recipe.